It’s dirndl time! But it’s not for Oktoberfest. Oh, no. 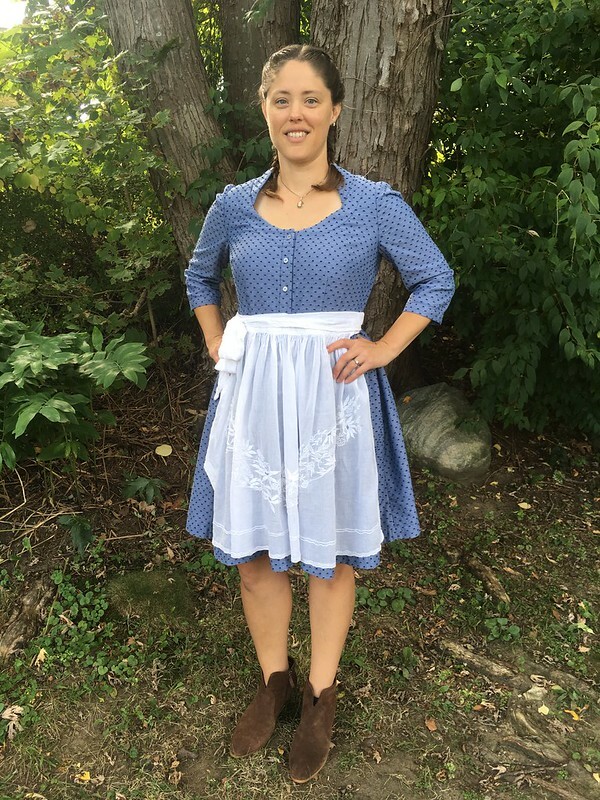 I finally made a dirndl, and I made it for…a German-themed birthday party! It’s not every day you get to say that. And yes, it was as awesome as it sounds. 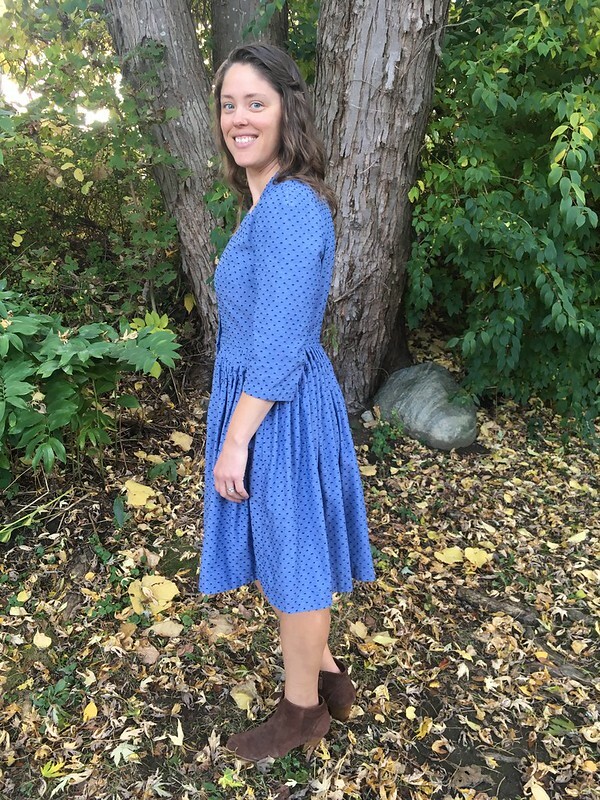 Being practical (and on the lookout for a dress pattern I would use in my everyday life) I chose Burda Style 7084. 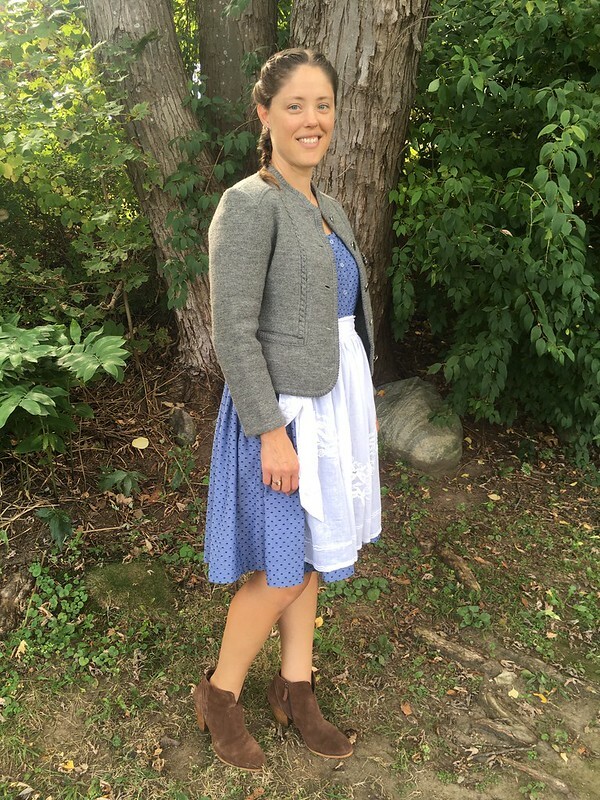 My hope was that with the apron, it would look like folkwear, but without the apron, it would magically transform into an everyday dress (#secretdirndl). 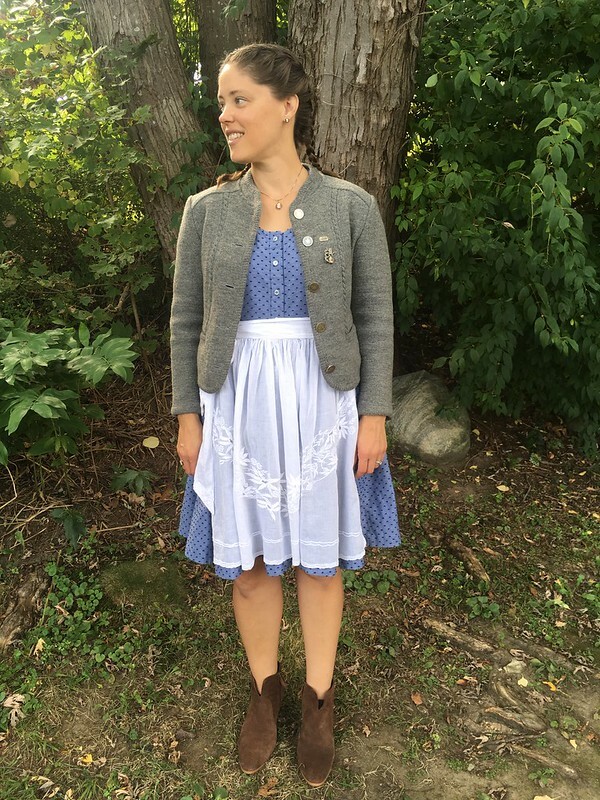 There seems to be quite a lot of variation in the traditional look, which Gertie touches on in this blog post on dirndls and wearability, so my idea wasn’t too out there. Additionally, as much as I love the look of the dirndl with the blouse, fitted bodice, and gathered skirt, if I was going to actually wear this more than once, it was going to need more ease and bust coverage. So, despite some trepidation that I wouldn’t finish on time or that something would go amiss, I got started. 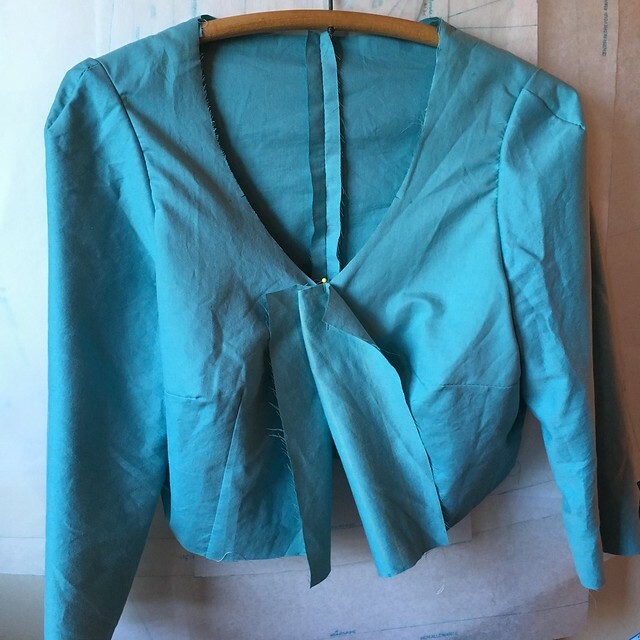 Before making the dress, I did a major broad back adjustment on the back bodice piece, and then made a quick muslin of the bodice. Thankfully, that worked out and showed me I was on the right track. 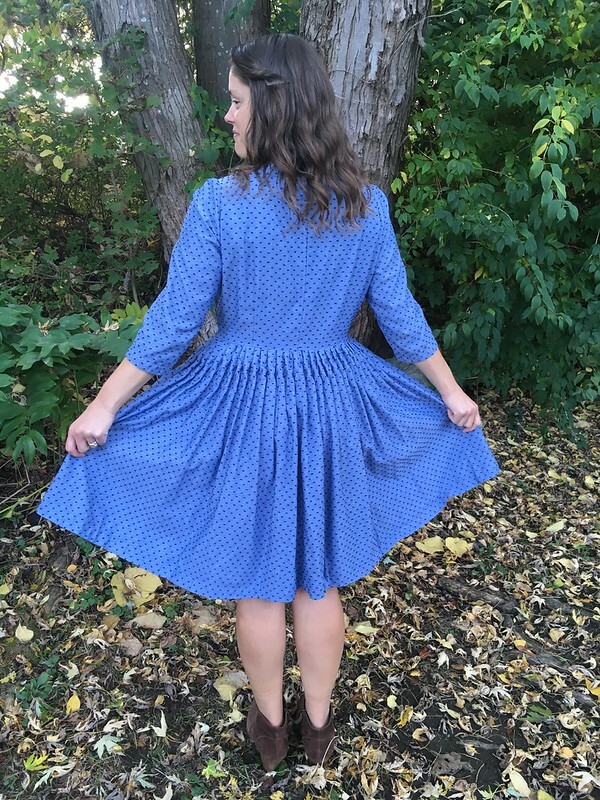 Although my measurements put me at an 18 for the bust and waist and a 20 for the hips, I made a straight 18 since the hip part of the dress is really just a lot of gathered fabric, which seemed pretty forgiving. I made View A, with the little collar, but in the shorter length. 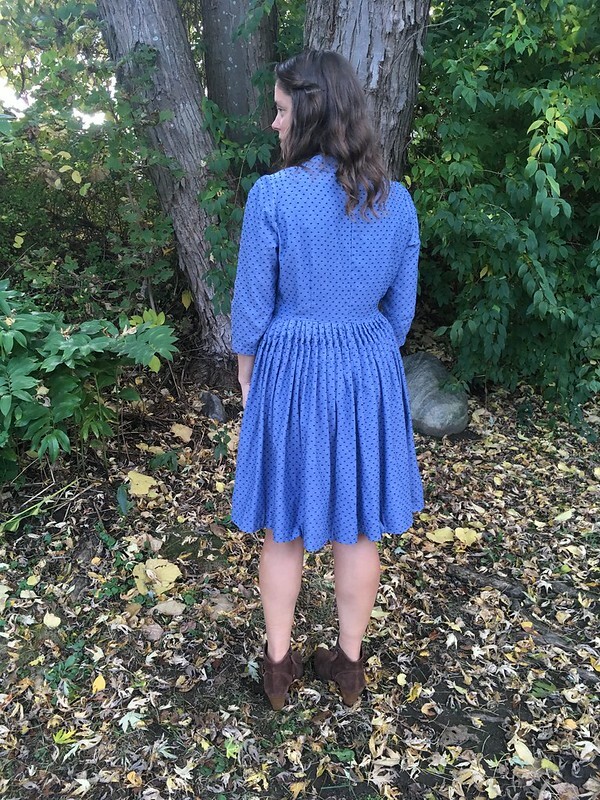 I hadn’t spent time sourcing fabric, so I was hoping that I could use some from my stash, and choosing the shortened length both saved me fabric, and made the dress fit my preferences better. In the end, the dress was almost free. 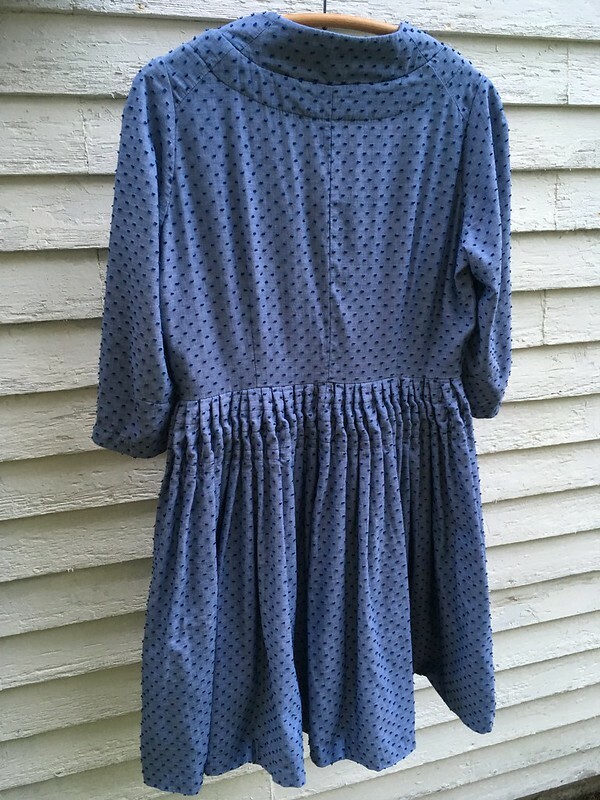 My outer material is a very lightweight, nearly sheer Swiss Dot Chambray in a color called Denim by Robert Kaufman. I bought it with a gift card I won in a giveaway from The Cloth Pocket in Austin, Texas (Thanks, guys!). I underlined it with an old sheet, which added opacity and body (and also cut down on wrinkling). 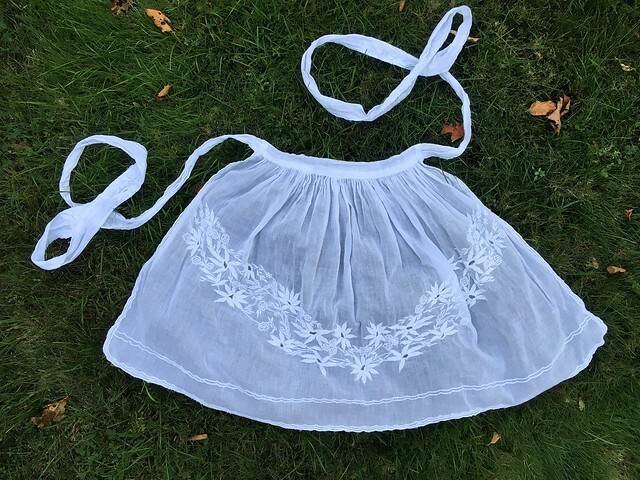 For the apron, I used a sheer cotton embroidered curtain panel someone had given me. All I really had to buy was the pattern, some buttons, and pencil pleating tape for the gathering on the skirt. All of those things came from Jo-Ann Fabrics. The pencil pleating tape was a little tricky to find. 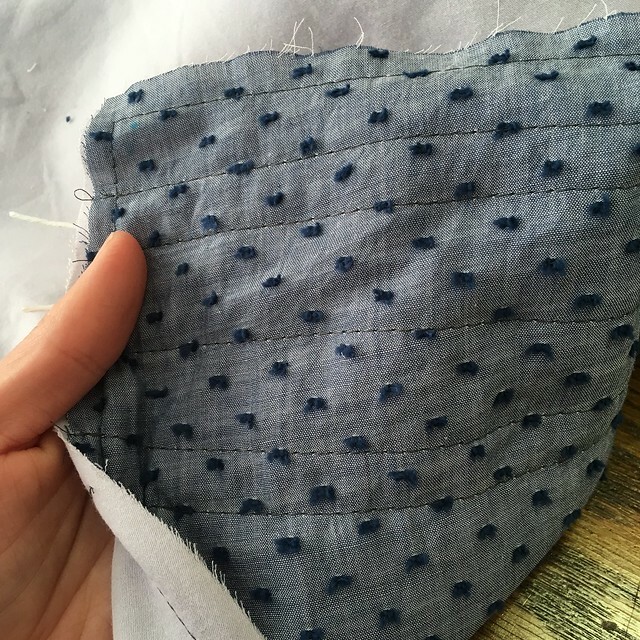 You can gather the skirt by hand (as shown in this blog post), which I would love to try someday, but I was happy to have a quick option for this project. I did some googling and didn’t turn up much. 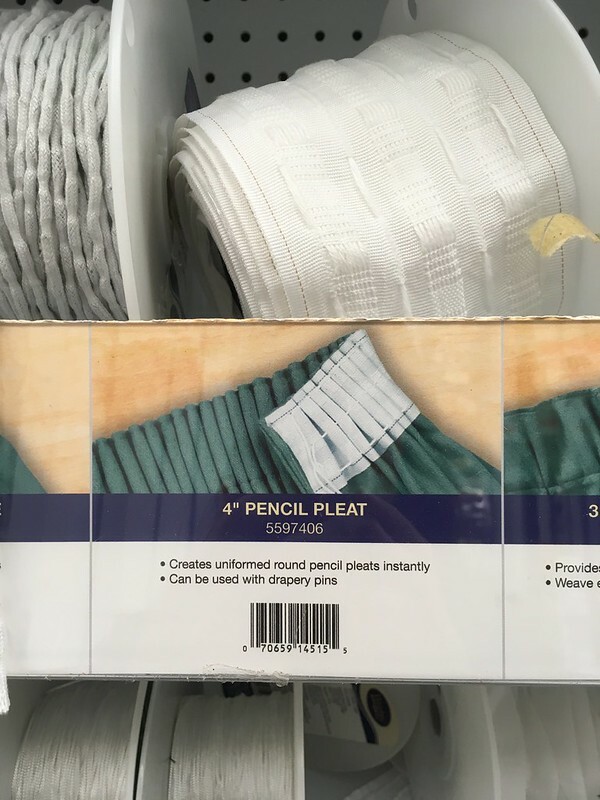 In the end, I found 4″ pencil pleating tape for sale by the yard in the upholstery section of Jo-Ann’s. 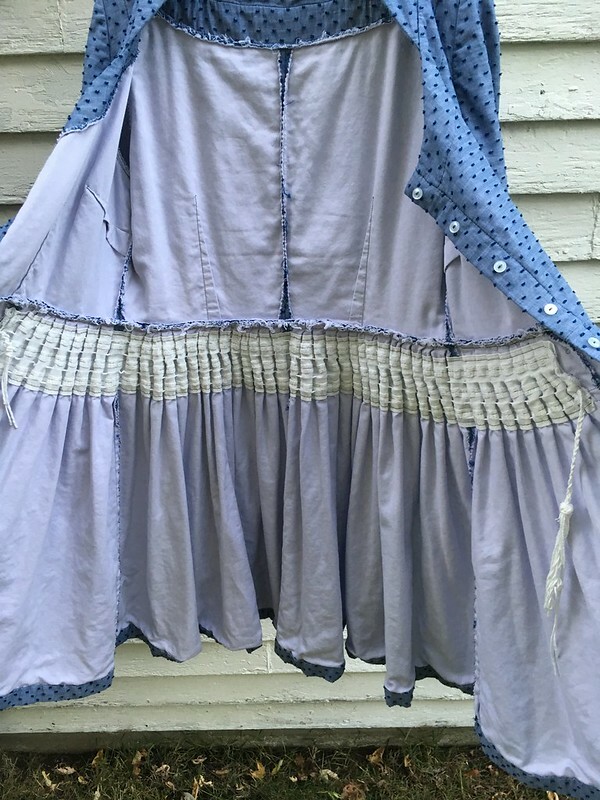 In order to use it, I sewed it to my assembled skirt, pulled several strings in the tape to gather the fabric, and adjusted the gathers until the skirt fit the bodice and my hips. I braided the long ends of the ties and loosely knotted them rather than cutting them short, so that I could adjust the skirt in the future should I ever need to. Then I sewed the skirt to the bodice. 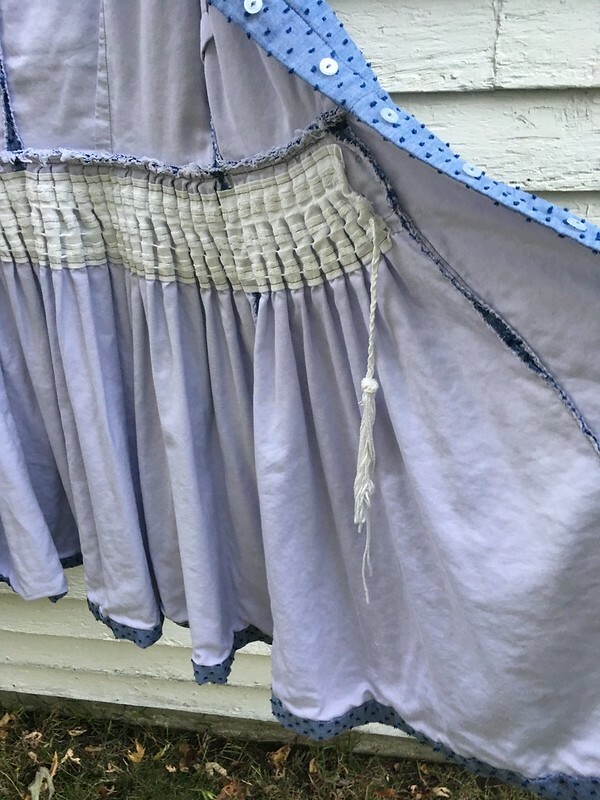 When making the apron, I didn’t think about the fact that the apron length is meant to go with the longer skirt, so I had to take it apart after I thought I had finished and shorten it from the top since I was trying to preserve the embroidery along the edges. In the end, though, the placement of the embroidery was much better on the shortened apron than it had been originally. 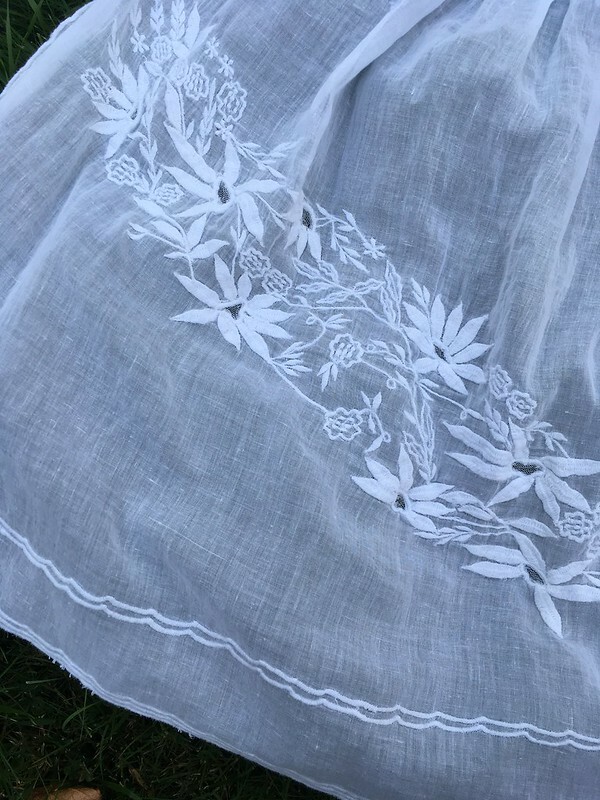 I’m so glad I found a use for this gorgeous and delicate fabric. It definitely looks like I put more work into it than I did! I decided not to add the rick-rack the pattern called for, and I chose really basic buttons in the interest of frugality and wearability. Despite my fears, I finished in time, and I love my dress and apron. It doesn’t hurt that I already owned a real, traditional German jacket. It made for the perfect outfit! The party was a blast, and I have worn the dress many times since making it, both with and without the apron. It was the perfect first dirndl project. Maybe there will be more to come? Hopefully! I’d love to try these Buckeye Turtle Brownies. Just the name sounds amazing! 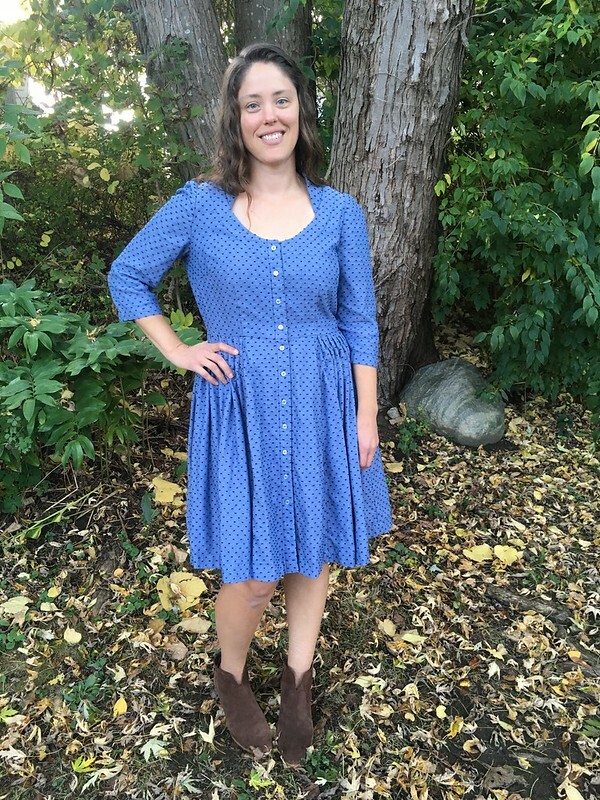 This Kalle Shirt Dress that Marcy made is so great. I’m really obsessed with this outfit from Denim & Supply by Ralph Lauren. I need to make a wool vest, stat! Actually, I want the whole outfit, and with sewing as my superpower, it’s not out of reach! Does this mean I need to enter Designin’ December? I love it! It looks so great on you!!! 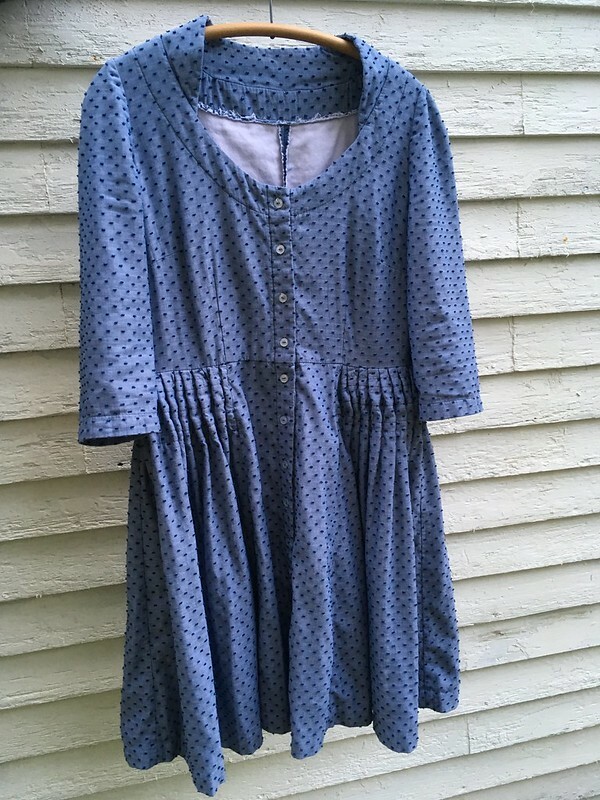 Really I love everything about this dress and the apron…so very cute! Thanks, Kim! I really appreciate that. I was afraid I wouldn’t be able to pull it off, but it worked, and I’m so glad I tried. Oh, I love it so much! I have a blue dirndl that looks almost identical. Let’s wear them and be twins! I could never sew one, but I wonder if I bought the pattern you suggest, if I could get someone to make one for me??? Love, love, love it! Oh, my gosh, I would love to be dirndl twins!!! 😀 Thanks for your kind words. I bet you might be able to find someone who could make it. It would be great if you found someone local to you for fittings and such. 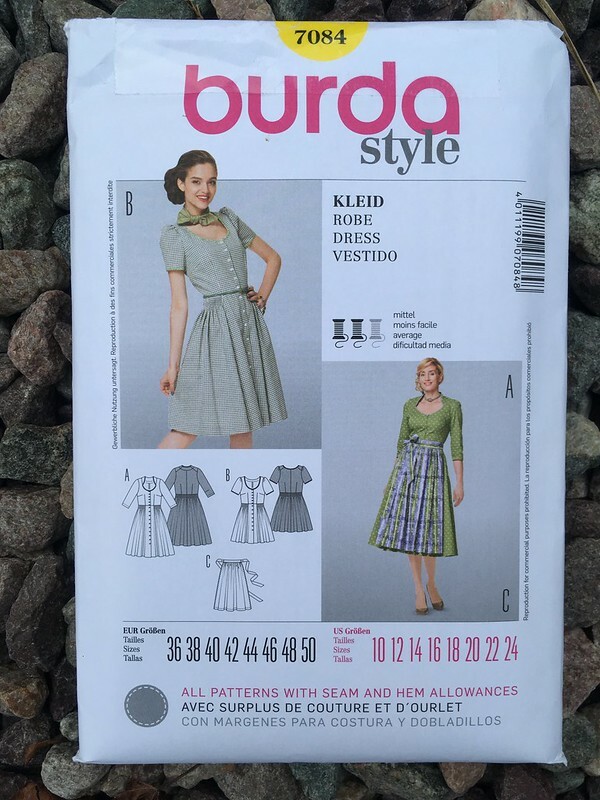 Burda has a few other patterns as well that look even more traditional than this one, so there are options. 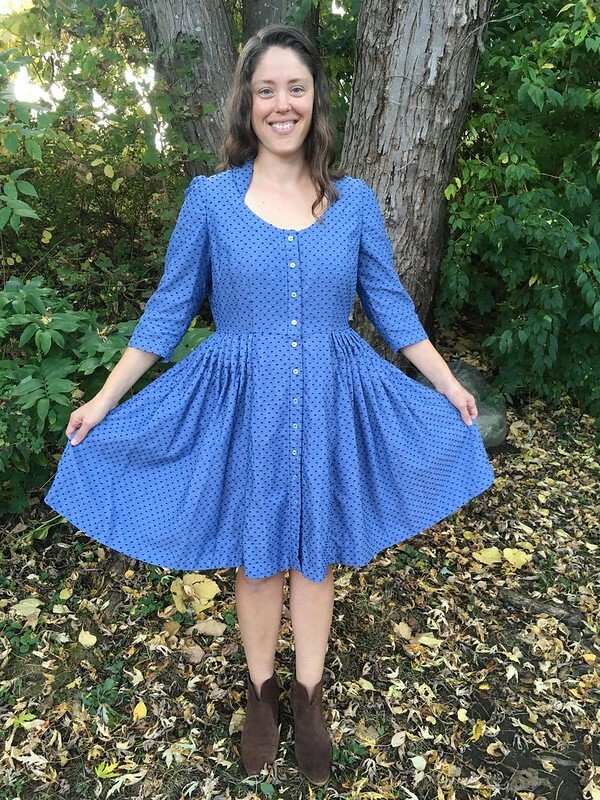 Folkwear also has an Austrian dirndl pattern, but Burda will be less expensive. 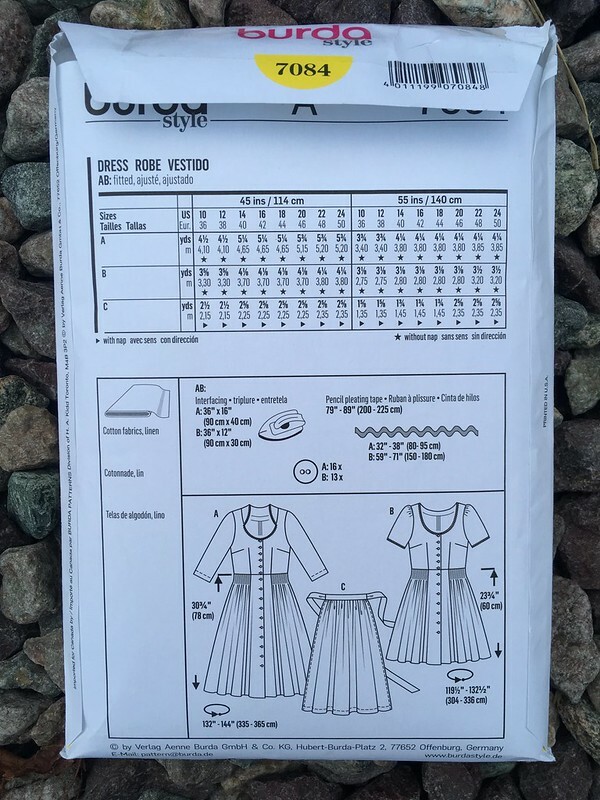 You can look through all Burda’s patterns at Jo-Ann’s or even online. Let me know if you do it! Wow, when I saw you in your Dirndl the other night I had no idea there was so much detail in it. 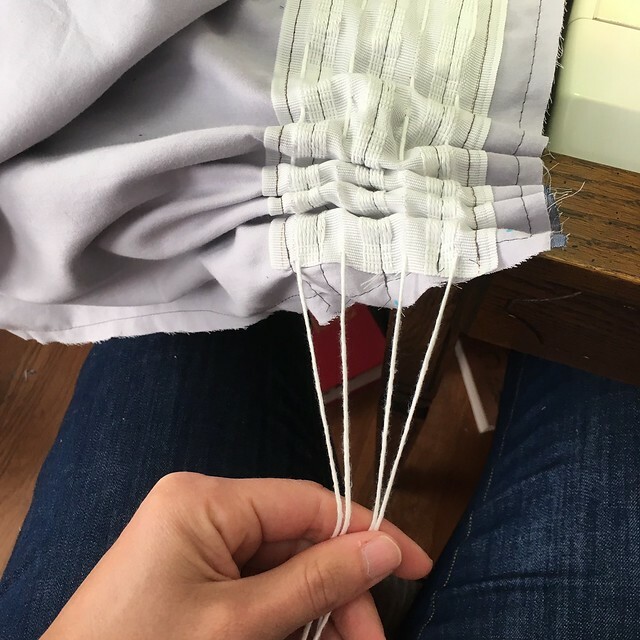 Pencil pleating tape! I’ve never heard of it? Looks cool, seems pretty straight forward. Was it fairly easy? And what a fabulous idea for the apron. You continue to amaze!!!!! Thanks! It was a lot more straightforward than I thought it would be. I was pretty nervous when I started, but it wasn’t bad at all. This is great. I think you really did a great job on the Dirndl, but yet still wearable everyday look. I’ve never thought about using that tape for pleating the skirt, but it really works great. I might have to try that one day.